What Do I Do Now That I Have All This Time on My Hands? Between writing and scheduling blog posts, staying in touch with friends, reading, and creating art, I barely have time to wash the dishes, exercise, or meditate. However, in Facebook groups for vandwellers and other internet resources for people who live nomadically, I regularly encounter people asking for advice on what to do now that they aren’t working full-time, permanent jobs. Some people have never had free time before, so they’ve not learned how to entertain themselves. Others are fine as long as they’re moving from place to place and seeing new things, but if an injury or lack of money means they have to sit on public land or in the same town for a week or two, they’re bored out of their minds. For all the nomads who are trying for the first time to figure out what to do with themselves and for folks who want to try something(s) new, I offer ten activities to fill your time now that you own your life. #1 Explore the public library. As may have been evident from my post 10 Ways to Save Money on the Road, I’m a big fan of public libraries. Even if you don’t have a library card, you can probably hang out away from inclement weather; use a computer to surf the web; read books and magazines; view art; and attend free movies, concerts, lectures, and classes. Some public libraries will issue library cards to nonresidents. If you can score a library card, you may be able to enjoy books, music, and movies in the privacy of your own rig. I encountered this Little Free Library in my travels. #2 Read! I’m also a big fan of reading. 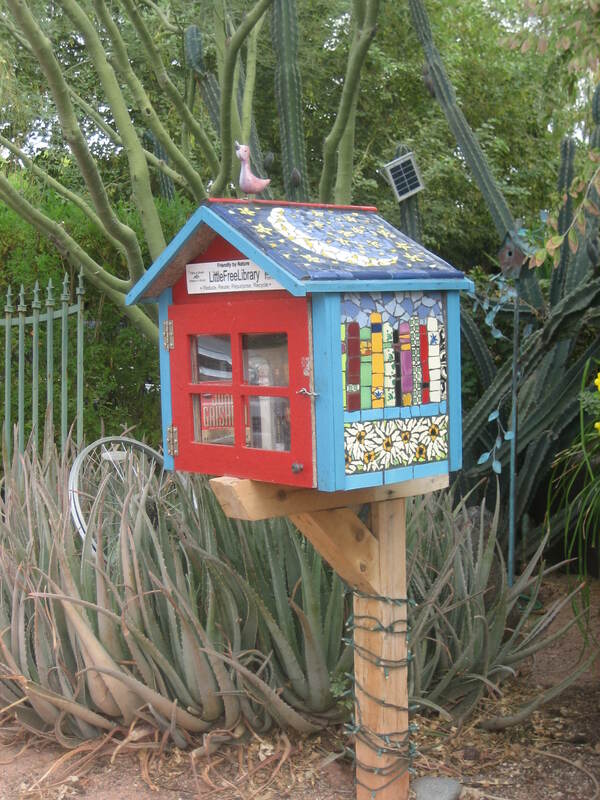 If you can’t borrow books from a public library, get books from Little Free Libraries. Find inexpensive books at thrift stores and library book sales. If you’re staying in a campground, check for a library in the clubhouse or office. If you rather look at photos and read short articles, acquire magazines instead of books. Magazines can often be had at thrift stores and library book sales for 10 cents or a quarter each–if they’re not outright free. Maybe you have a friend in another town with a magazine subscription who will put together a care package of back issues and send them to you via general delivery. If you don’t like to read, but you do like to listen to stories, consider audiobooks. How cozy would it be to lie in your bed and have a talented voice actor read you a bedtime (or nap time) story? If you like the classics, Open Culture offers links to over 900 free audiobooks. For more options, Book Riot offers a list of “11 Websites to Find Free Audiobooks Online.” These are all legal audio book options. If you’re wondering what podcasts I like, read my post about my favorites. #4 Learn to do something new. If you’ve always wanted to (fill in the blank with an activity of your choice), but never had the time, your time has come. The Instructables website shares directions for almost any DIY project, craft, or van-home improvement project you can think of. You can learn a lot on YouTube too. I taught myself to macramé hemp jewelry, and The Man learned how to replace drum brakes by watching YouTube videos, so I suspect most folks could use YouTube to learn a new skill. #5 Play a musical instrument. Whether you’re an absolute beginner or a lapsed musician, use your spare time to play an instrument. The Man carries an acoustic guitar in his mini van so he can play whenever he gets the urge. Coyote Sue often practices her flute while boondocking on public land. If space is at a premium, go for something small like a ukulele, a piccolo, a kazoo, or a harmonica. If you’re lacking space and/or money to buy something, remember, your voice makes music too. I whipped up these postcards from collage fodder Coyote Sue sent me. #6 Write Letters. Don’t think you have to be a great writer to wrtite letters to your friends and family. Trust me, your people will be so excited to get what I call “real mail,” they’ll barely care about what you write. If you’re too shy to write to the adults, write to the children. Kids always seem super excited to get mail. If you don’t think you have enough to say to justify writing a letter, send a postcard. In tourist towns, I usually find postcards costing between 20 and 50 cents each. At thrift stores, I’ve found postcards as cheap as a nickel each. It doesn’t matter if you’ve never been to the place on the postcard. People like pretty photos, even if you’ve never seen the landmark in question. If you need a creative project, make your own postcards like I did. #7 Keep a journal. If you don’t much like writing, make it more like a log book where you record where you stayed, what you did, weather, gas mileage, or any information you might want to remember later. If you rather draw than write, sketch the trees, the people you meet, the critters you see. 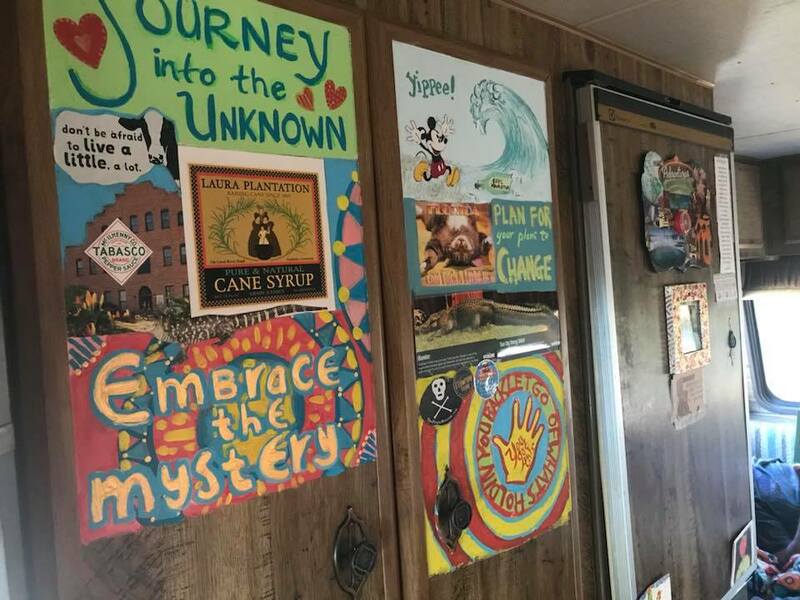 This is how Coyote Sue has been decorating the inside of her rig. She gave me permission to use this photo. interior of your rig. Sketch your campsite. Make jewelry. 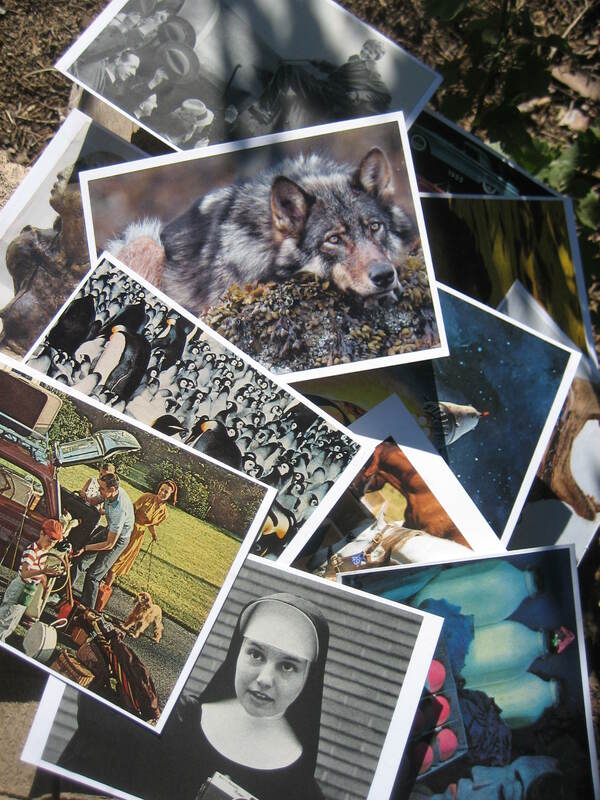 Make your own greeting cards or postcards. Sculpt with air-dry clay. Whittle. #9 Take some photos. With today’s technology, you don’t need a fancy schmancy camera to take decent photographs. Most smartphone cameras let you use filters on your photos; adjust contrast, sharpness, and exposure; crop your image; and doodle right on the picture. With all these bells and whistles, you can take a decent photo and turn it into an awesome photo. Of course, if you don’t know the basics of composition, you’ll want to learn that too, courtesy of ePHOTOzine. #10 Get close to nature. 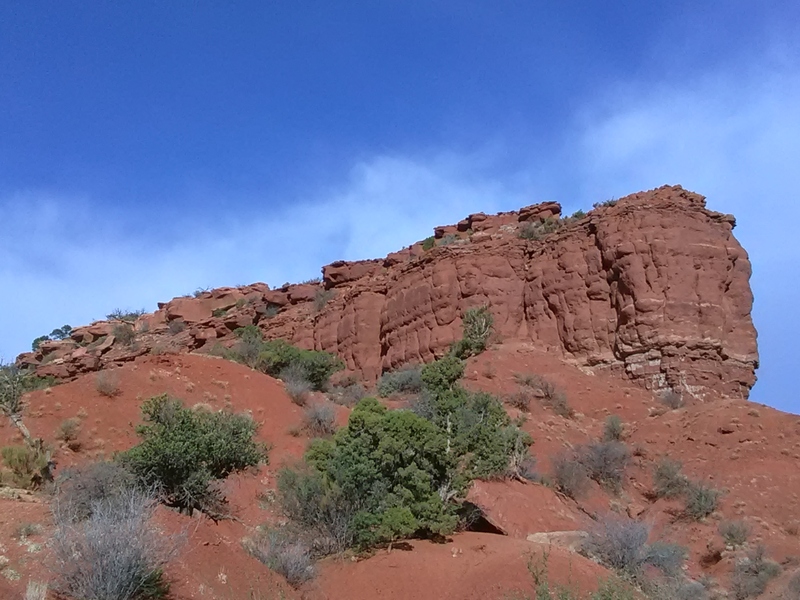 If you’re on public land, put on your sturdy shoes and go for a hike or a little walk, if that’s what you’re up for. Sit still and listen to the birds sing. If you’re in a city, get closer to nature in a park or arboretum. Learn to identify the trees, flowers, and/or medicinal plants in the area you’re in. At night look up at the sky and find the constallations. Paying attention to the cycles of nature could keep a person occupied for days, weeks, months, or even years. I got close to this nature while boondocking outside Natural Bridges National Monument. I hope this post inspires you to try some new things and figure out what fun activities make you happy as they fill your free time. Feel free to share what you do to stay busy in the comments below. I took all the photos in this post with the exception of the one of Coyote Sue’s rig decorating endeavors, which I used with her permission.